Guadalajara, the most Mexican of Mexico’s cities, offers tourists and travelers alike a wide range of traditional and contemporary attractions to ensure a fulfilling and enjoyable visit to Mexico’s second largest city. Home of Mariachi, Mexico’s traditional folk music, Guadalajara retains a colonial feel with its numerous plazas and stunning architecture, and without the apparent dangers and city rush of the capital. Moreover, if you’d like to sample the local brew – Tequila is just an hour away and is a must for any visitor to Mexico. Enlivened by a substantial student population, Guadalajara is also a growing attraction for the younger generation and guarantees many a lively Tequila fuelled night out at any of the spirited barsor nightclubs that scatter the city. 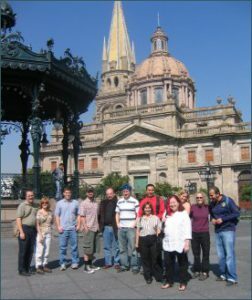 Jalisco state is also a hotbed of adventure sports such as surfing and paragliding.